After a couple of years without reviewing a plastic boat – more specifically polyethylene - three have come along in quick succession. Where the other two were unmistakably plastic products, this one is far more traditional in form. 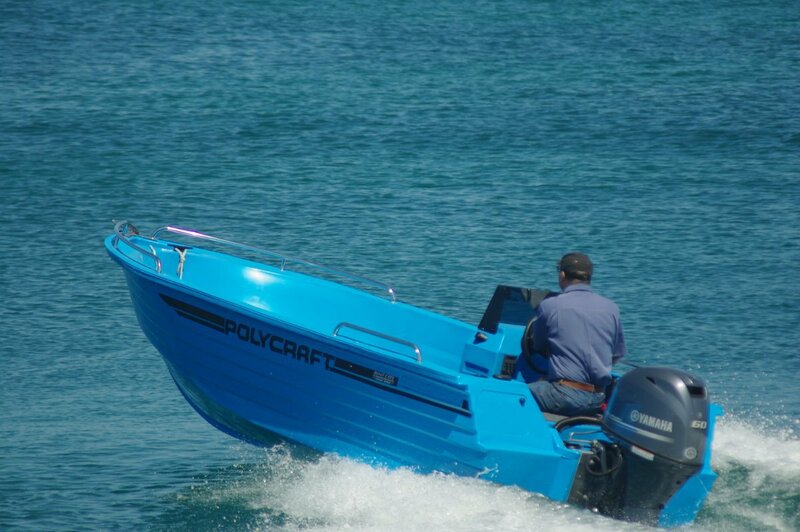 The Polycraft range comprises boats that at first glance could be fibreglass or, just possibly, aluminium. But the clues come thick and fast once you board: the hull has a double skin; every component that could reasonably be moulded has been; and no aluminium boat was this cool to the touch in summer. The parts that need to be metal are: winch wire stem fitting, bowsprit and roller are in stainless steel, transom mounting plate in aluminium. 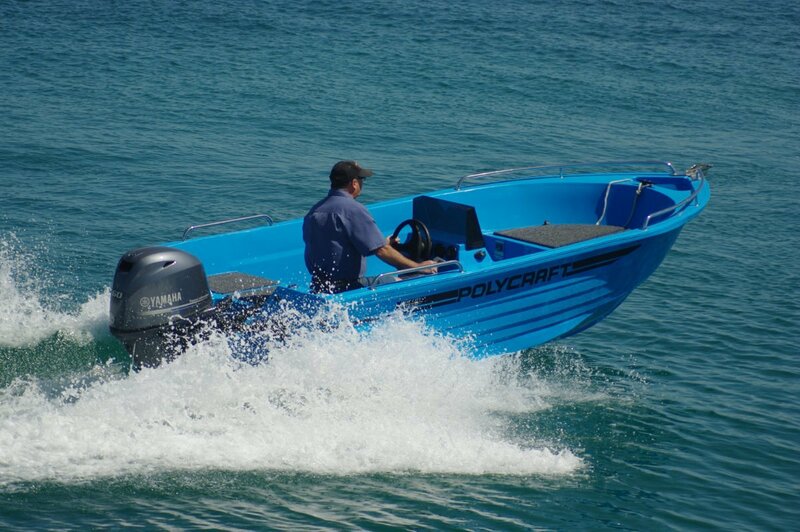 The review Polycraft is the 450 Drifter in the increasingly popular side console layout. 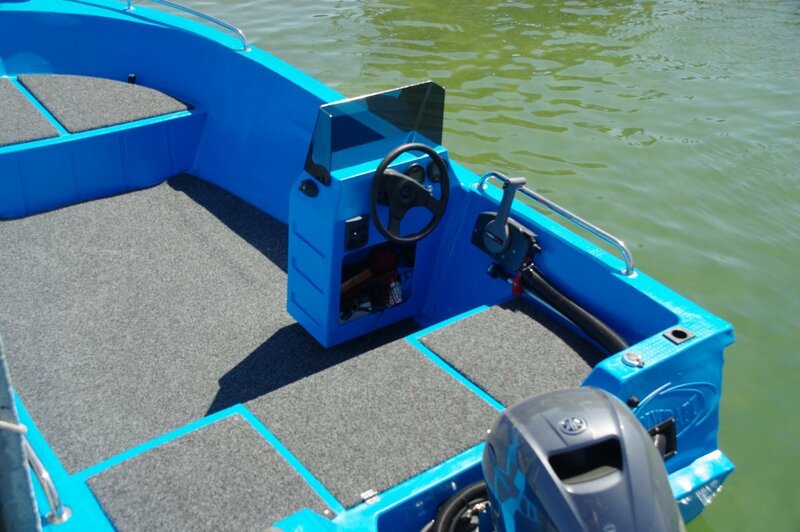 In boats around this size – 4.5 metres – it gives more useable deck area than the traditional centre console. Polycraft has maximised this area by making the console as small as practicable and by seating the driver on the transom locker/bench. The console houses a simple stowage cave and has a minimalist dash. Engine gauges are the traditional round analogues – generally easier than digital to read at a quick glance. The acrylic windscreen is in scale with the console, but despite its diminutive height does a better than fair job of deflecting wind. There are no grab handles ahead of the driver, but rails at the quarters offer occupants of the bench seat a secure grip. The middle part of the bench is the lid to a capacious locker that Boat City had used to house a pair of batteries. Having a second battery takes care of about half of the possibilities for not getting home unaided (the other biggie is running out of fuel). There are seats on that bench for just three, which is a likely maximum load for a fishing trip but perhaps a bit snug for any distance. Also, three adults right aft in a light boat can produce unhappy trim. There are no other official seats, but the bow platform has this auxiliary role, taking extra passengers or using them as organic ballast. The bow rail, though a bit low for actually standing on the platform, works fine for anyone sitting. The platform has the same covering as the bench and the deck: carpet. There is a pair of stowage bins below the platform, reached through large hatches; these can be used for ice slurry or general storage. Our Drifter had a 60hp Yamaha four-stroke powering it, delivering very respectable performance. Driving two-up the unloaded bow moved up and down a little but made absolutely no fuss about it. This was the polyethylene at work. A non resonant material it also has a little give, absorbing the small shocks while providing a near silent ride. Other than the motor’s sound, of course, but this was far from raucous. The 450 Drifter drips practicality. The big feature is space, emphasised by the lack of clutter – the only real add-on to basic boat is a pair of rod holders. An owner could add personality or choose to keep a clear fishing platform. The 450 has the prime requirement for making the space useable: good stability. An endearing feature - to an owner if not the boat builder – is the hull’s virtually indefinite life. Aluminium and fibreglass are often capable of outlasting the owner but they can have their problems. Fibreglass can be subject to expensive damage from a decent impact with hard things; older boats with timber content may get rot in hidden places. Aluminium can corrode – especially rapidly where sinkers and other non aluminium bits of metal are left in contact. Boat hire operators worked out long ago that boats that bend without breaking earn them more money. 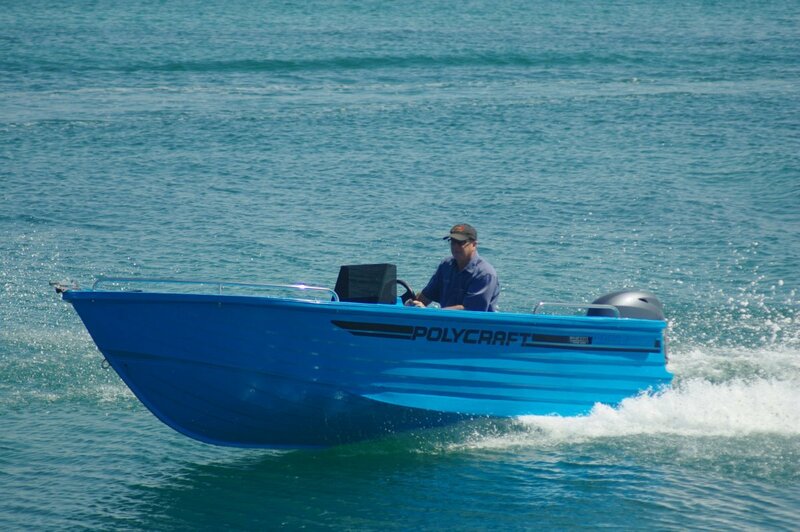 Polycraft populate a lot of hire fleets.